On the morning of 10 August 1904, the First Pacific Squadron sailed out of Port Arthur to engage the Japanese fleet blockading the port. 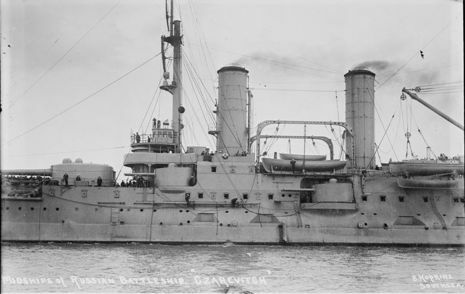 The Russian squadron consisted of the battleships Tsesarevich, Retvizan, Pobeda, Peresvet, Sevastopol, and Poltava, protected cruisers Askold, Diana, Novik and Pallada, and 14 destroyers. Admiral Togo had expected this breakout attempt and had positioned his ships accordingly. His fleet consisted of Japan's four surviving battleships Mikasa, Asahi, Fuji, and Shikishima, the armoured cruisers Nisshin and Kasuga, as well as eight protected cruisers, 18 destroyers, and 30 torpedo boats. Encountering the Russian squadron in the early afternoon, Admiral Togo's first move was to place the Japanese fleet between the Russian ships and Port Arthur, so as to prevent their return. When it became apparent that the Russians were heading for Vladivostok, Admiral Togo was far behind and he had to waste hours detouring around his weaker vessels so as to catch up with the slower Russian battleships at the head of the battle line. At 1743 hours he opened fire on the leading Russian ships, at a range of around 9,000 yards. From then until dusk Togo's First Division and the six Russian battleships fired at each other on almost even terms, with Mikasa and Tsesarevich receiving the brunt of the punishment. Throughout late July and early August, as Japanese troops had closed in on Port Arthur and as shells had started falling in the town, the correspondence between Viceroy Alexieff (commander of Port Arthur) and Admiral Vitgeft (Makaroff's replacement) had become more and more acrimonious. What was to become of the fleet? Alexieff favored a sortie so that the Port Arthur ships could link up with the Vladivostok Squadron, and create a force powerful enough to challenge the Japanese. Admiral Vitgeft felt that just staying at anchor and contributing some of his armament to the land battle was the safest course to follow, and that's exactly what he proposed backed up by his flag officers and captains. In their view the risks of a sortie were too great to be contemplated. "I again reiterate my inflexible determination that you are to take the squadron out of Port Arthur. I must recall to you and all serious officers the exploit of the Varyag. The failure of the squadron to proceed to sea regardless of the Imperial will, and of my command, and it's extinction in the harbor in the event of the fall of the fortress will, in addition to the heavy legal responsibility, leave an indelible spot on the flag of St. Andrew and on the honor of the fleet. You are to make known this telegram to all admirals and commanding officers and are to report its receipt." Faced with an order couched in these terms even Vitgeft could not hesitate any longer.